Are V magnet motors the key to overunity? Iv'e been keeping track of the latest backyard designs on youtube for a few years now, and it always seems very possible but no one ever pulls it off completely. Here's the first one I came across which displays the main principles involved with the V-magnet motor. The dead point at the beginning always causes the the rotation to eventually stop, no matter what speeds you first get it up to. There's plenty of attempts at getting around this dead point, ranging from off setting the rotor to adding weights, but I haven't seen any one try the idea I came up with. The idea involves adding two extra stator magnets and equally spacing the 3 around the rotor. I think this would add two stators to drive the rotor while the third hits the dead point and is forced past, due to the power provided by the two driving magnets. When the dead point hits A, then B and C will be driving the rotor. When the dead point gets to B, then A and C will drive the rotor etc etc. Re: Are V magnet motors the key to overunity? Here's one with a few mechanical attachments used to overcome the dead point. By the looks of it, it uses 2 stators, a large one at the top and a small one at the bottom, both controlled by an arm. Apparently its a fake because he has another magnet in his shirt, but I'd love to get my hands on this model. Last edited by edy420 on September 10th, 2011, 9:30 pm, edited 2 times in total. Good post. I always applaud people for actually building models and trying them. Let us know what you find. edy420 wrote: Here's one with a few mechanical attachments used to overcome the dead point. Yeah, they're always fakes, but half the fun is building one to see if you can fake it also. Go for it. Thanks, this is very cool. I can almost believe the version where he jerks the magnet away just in the nick of time. Mostly because he might be adding external energy to the system using his muscles. The second version can't work because the hammer/cam effect couldn't drive the primary magnet far enough away. He doesn't have a magnet up his sleave.. that's funny. To fake this, I would use the same wheel but alternate the magnets polarity on the wheel. The primary (fake) magnet and hammer/cam are for show. Underneath the table is a motor driven version much like the visible wheel with alternating magnets. Spin this hidden wheel and the pair act like a magnetically coupled gear. Very clever and fun.. Thanks for the post! Here is one that relies on shrinking ropes not magnets. I wrote to you before. Perhaps you've thought of suspending the "initiating" magnet (2 pcs. fishing line). It would be suspended inside a standing frame with "weak" springs hooked through holes drilled through points in this magnet (stabilization). You begin the correct swing; perhaps attractant/repellant fcs. keep motion of both wheel and formerly 'hand-moved' magnet. If your goal is a clean dynamo or curiosity, either is immensely valuable. My first attempt was with curved magnets I collected from an old Fisher and Pykel washing machine motor, but I discovered the polarities were all out of sink... I would have north and south fields alternating throughout the length of the magnets, so they were no good for this experiment. But I did find that neodymium magnets at a high rating are far too powerful for a practical prototype, I couldn't even get the magnets to stay fixed as the force they were producing would pop out any other magnets close to them. I can't remember the rating, but if I held a stack of 15 and placed the last one over 1m away, it would smash into the stack from magnetic attraction. Or I could have two stacks of 8 which could stay stuck on opposite sides of my biceps. Unfortunately I have a short attention span, so I'm jumping between 5 hobbies at the moment (including posting on a philosophy forum) and playing with 5 kids and a happy wife. Another time consuming hobby I'm playing with is would you beleive it..
Enigmonaut wrote: Thank you for sharing. The crow bar in the forge is now a complete blade. I got the refractory blanket free with the bricks, but it wasn't enough to make a door. Also, I move to Australia in one month, so I won't invest any time or money into this project at least until I'm settled in and found a job etc. Neat! I keep toying with the idea of building a forge in the backyard. My wife thinks it a really dumb idea and the neighbors live too close to put up with the anvil ringing at six in the morning. Nonetheless, keep sharing that with us. I don't know if its the fire bug in me, but playing with a forge is awesome fun. My anvil is just a large piece of a broken arm from a log harvester that I found out in the bush. It had an awful ring to it, but now it has the 16 neodymium magnets from my V motor experiment, attached to the side of it, which absorbs a lot of the ringing noise. Enough that now the neighbours can't hear it. Another noise reducer I like to use, is the rain. I do most of my blacksmithing in my shed away from the kids, and the rain is the best noise reducer out! 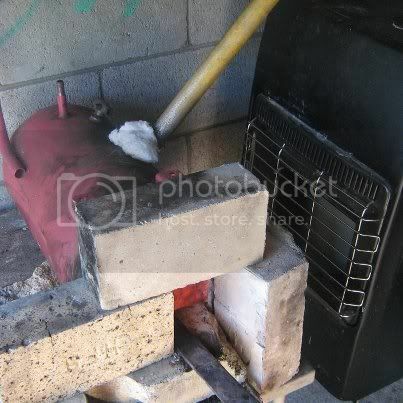 My first forge was a coal one, that I made from a frying pan, attached to the top of an old paint tin. Then, with a vacuum cleaner as a blower, I inserted the hose end into the side of the paint tin and drilled holes between the paint tin and fry pan. It gets surprisingly hot, hot enough to melt my first two knives before I completed them lol. My problem was I couldn't source a clean burning coal, instead I had to buy large chunky coal that also had lots of contaminants in it, which is why I switched to gas. But if you can't source parts for a gas one, a coal one is much easier to build. You can even make them from a small pit of mud! 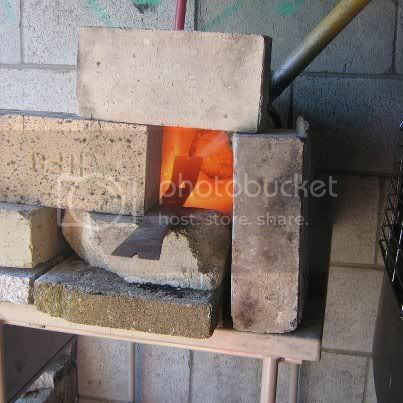 If I have time this weekend, I'll pull out my coal forge, take a picture of it and post it in the lounge.